Friday is the Opening Gala for the Wilmington Chocolate Festival for Liberty Hospice. I was invited to participate as a gift vendor as opposed to all the yummy chocolate vendors! I donated this ring for the silent auction fundraiser for the event. 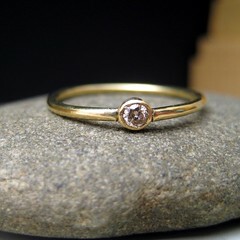 It is a 2.5 mm champagne diamond (sometimes called a chocolate diamond) in 18k yellow gold. The retail price is $325. I will have 5 other champagne diamond stacking rings in 18 karat gold as well as my gemstone stackers in 18k and sterling for sale there as well. Tickets can be pre-purchased at Harris Teeter for $5, or they are $8 at the door. I hope to see you there! I hope it goes well Sara!